"Wearing body-armor and a helmet, I observed intensely dramatic combat rescue simulations that involved a variety of powerful weapons and live ammunition. 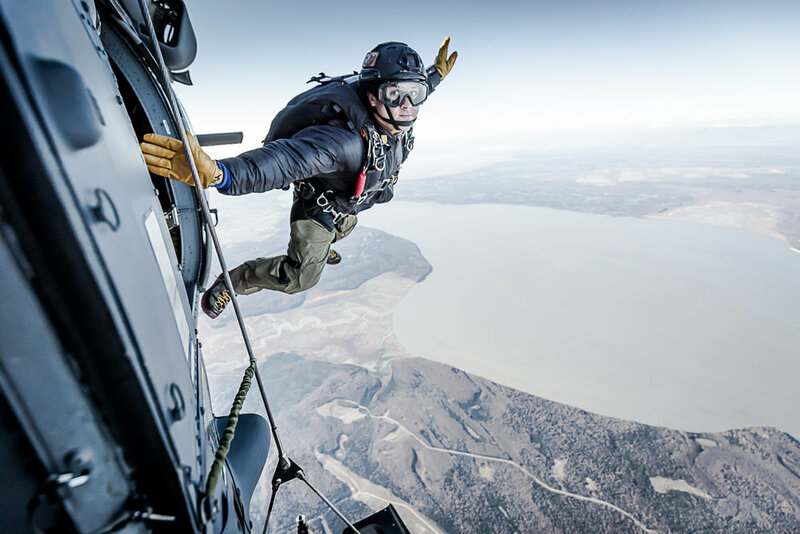 On another missions we flew to high altitudes in helicopters to practice landing in mountainous and highly glaciated areas, where I experienced the limitations of an amazing helicopter in an extreme environment." "Smoke rises from a bundle of burning sage, wafting towards the ceiling like a curious ghost. The earthy ambrosia is an introduction into the unorthodox ways of a complex artist, working in his studio. The tangy smoke puts him at ease. It sets the stage. In the background is a bluesy voice on the stereo, William Elliott Whitmore singing “Who Stole the Soul.” It's a fitting song that complements a more immediate sound in the foreground. An enigmatic, electric buzz emanates from a primitive looking, hand-held machine no bigger than a deck of cards. DUTY BOUND is a new initiative of the Alaska Humanities Forum. It draws on the power of the humanities to support deepened understanding of the experiences of Americans afﬁliated with the armed services, whether active-duty, reserve, National Guard, retirees, or veterans. Projects supported by the Forum in the spirit of Duty Bound include Unseen, an ongoing series of portraits of the men and women of the Alaska Air National Guard Rescue Unit, created by Alaska writer and photographer Joe Yelverton. Anonymous Samurai and the accompanying photographs resulted from time Yelverton spent with Alaska Air National Guard pararescue jumper Roger Sparks, who received the Silver Star for conspicuous valor in combat for his actions during a battle in Afghanistan in November 2010. We have previously reported at length on Alaska Air Guard pararescue jumper Roger Sparks for his action under fire in Afghanistan, the Silver Star he received for those actions and any number of daring rescues in Alaska. Previous dispatches have noted his increasing interest in tattooing and work as an emerging tattoo artist. Local photographer Joe Yelverton has been taking photos of Sparks as he inks clients for the past year, during which he's noticed "a compelling story emerge about adaptation."